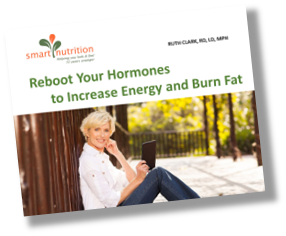 Participants in the study either skipped breakfast, ate a normal breakfast (13 grams of protein) or a high-protein breakfast (35 grams of protein, including eggs and beef) for seven consecutive days. On day seven, food cravings and dopamine levels were examined. Both groups of breakfast eaters, reported reduced cravings for sweet and savory foods while the breakfast-skippers’ cravings increased. The researchers also saw an increase in a metabolic marker for dopamine. Dopamine is a neurotransmitter responsible for transmitting signals between nerve cells in the brain. It’s a feel-good neurotransmitter associated with pleasure and reward creating a rush of euphoria that the brain seeks repeatedly. Protein appears to jack up the levels of reward chemicals in your brain, which help quell your unhealthy cravings. This may be because protein is an excellent source of the essential amino acid tyrosine. Tyrosine is a precursor of dopamine.When it came to both food cravings and dopamine-related metabolites, the high-protein breakfast eaters experienced the best results. We often find ourselves rushing to get out the door in the morning so many of us neglect a protein packed breakfast. As a result, we experience mid-morning cravings for sugary foods like donuts, pastries or even a bagel. A Protein Smoothie made from great quality protein powder with 0 grams of sugar and 15 to 20 grams of protein from whey, pea protein or hydrolyzed beef. The protein source depends on your tolerance. Plain Greek yogurt which contains double the protein of regular yogurt. Just add berries for some sweetness and nuts for healthy fat. Eggs in any form. Scrambled, poached, an omelet or frittata—they are all great. My personal favorite is Sunny Side Eggs with Swiss Chard Hash. Saute in extra virgin olive oil over medium half an onion, ½ bunch of Swiss chard chopped, and a handful of mushrooms for about 5 to 10 minutes. Push the hash to the side and add 2 large eggs to the pan. I like to cover it so the yolk cooks through without over cooking the white. It’s delicious and it gets my one serving of greens taken care of for the day. 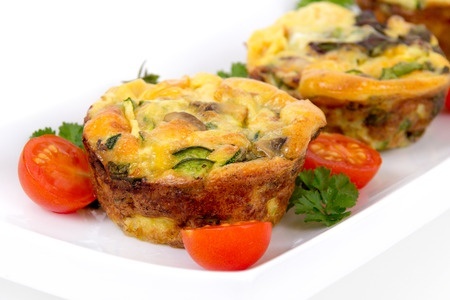 Another great idea for eggs is Breakfast Egg Cups because they are so easy to freeze and just shake out of the bag. By the time you get to work these delicious packages of nutrients are thawed and ready for you to enjoy. 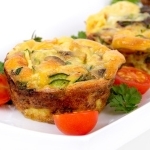 See the recipe here: Breakfast Egg Cups. Chicken sausage served with leftover veggies from last night’s dinner is a quick breakfast. If you buy the chicken sausage which is already cooked it won’t take more than 7 to 10 minutes to throw this breakfast together. Taking the time to set yourself up for what your body needs in the morning can help to reduce cravings all day long.